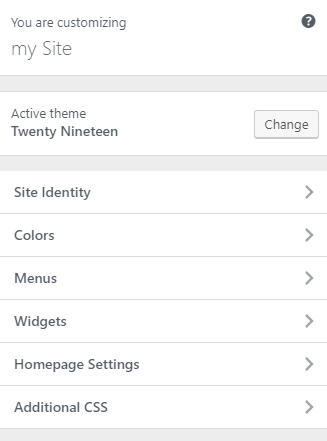 I have installed fresh Wordpress 5.0 with twenty nineteen theme. In admin panel for home page below colors setting a link to setting background image should be visible. See https://www.youtube.com/watch?v=zxAMjGC4z08 (41th second). What is wrong with my Wordpress? It's not present because it's not supposed to be present, it was removed. There's nothing wrong. This option doesn't exist in Twenty Nineteen. The video you've linked is from 2 months before its release, and doesn't represent the final product. Not the answer you're looking for? Browse other questions tagged images wp-admin or ask your own question. How to Disable Color Options?